FORT MEADE, Md. - A year and a half after he allegedly orchestrated the biggest national security leak in U.S. history, Pfc. 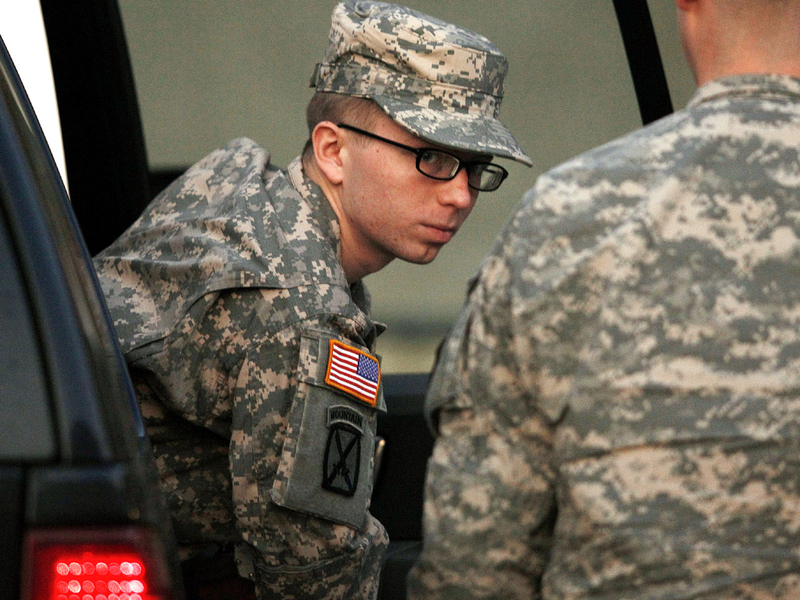 Bradley Manning's lawyers are finally presenting evidence in his defense. The 24-year-old former Army intelligence analyst, accused of releasing a trove of secret information to the WikiLeaks website, is not likely to testify Wednesday when a preliminary hearing enters its sixth day, military experts said. The government rested its case against Manning Tuesday in the proceeding at a military base outside Washington. Now it's the defense's turn. Though defense lawyers have revealed little about their strategy since Manning's arrest in the Iraq war zone in May 2010, some hints have emerged at the hearing that started Friday at Fort Meade. They got government witnesses to say Manning was a troubled young man who shouldn't have had access to classified material, let alone be sent to Iraq. They portrayed military computer security as lax at Manning's Baghdad workplace, where soldiers played games, music and movies on computers meant for classified information. And they raised the possibility that soldiers other than Manning could have used the shared computers holding evidence of the alleged crimes. Prosecution witnesses who served with Manning said he was well trained in rules prohibiting release of classified information. Forensic computer experts testified that they had retraced his keyboard strokes as he allegedly downloaded secret State Department diplomatic cables and raw battlefield reports from Iraq and Afghanistan. The hearing to determine whether Manning will face a court-martial became a case of techie vs. techie. Manning, who once worked as a civilian software developer, is deft at navigating the Internet. Intelligence officers who served with him in Baghdad said he was the unit's go-to guy for plotting data points, creating Excel spreadsheets and researching the enemy threat. But he may have been undone by others with better digital skills. A former hacker turned him in, and two info-tech gumshoes bored deep into several computer hard drives to find allegedly incriminating evidence. Adrian Lamo, a onetime convicted hacker and Manning's alleged online confidant, later turned a government informant. He testified Tuesday that he had given investigators records of May 2010 online chats in which Manning allegedly admitted everything. Army Special Agent David Shaver and civilian contractor Mark Johnson said they found evidence Manning downloaded and e-mailed nearly half a million sensitive battlefield reports from Iraq and Afghanistan, hundreds of thousands of diplomatic cables and a video of a deadly 2007 Army helicopter attack that WikiLeaks shared with the world and dubbed "Collateral Murder." The government wants Manning court-martialed for aiding the enemy and 21 other charges. Closing arguments could come as early as Wednesday. Then, a military officer will weigh whether to recommend that the young private be court-martialed, which could result in life in prison. That decision could take several weeks. During the proceedings, Manning remained outwardly composed as witness after witness talked about his emotional problems, his homosexuality, and his violent and crazed-sounding outbursts both stateside and during his tour of duty in Iraq from late 2009 to mid-2010. A half-dozen buttoned-down, mostly young men and women favoring charcoal-colored suits have come and gone from gallery seats behind the prosecutor's table, declining to identify themselves to journalists but apparently representing the Justice Department, the CIA or other government agencies. Across the room are Manning's supporters, including a long-haired young man from the Occupy Wall Street movement and a pony-tailed, elderly military veteran wearing a "Free Bradley Manning" T-shirt. Attorneys for WikiLeaks and its founder Julian Assange also observed, as did an Amnesty International representative. A half-dozen journalists were present and dozens of others watched from a separate building on closed-circuit TV. An ample number of people in the court room were in camouflage uniforms, including the presiding officer, all three prosecutors, two of three defense lawyers and military police stationed along courtroom walls.